QR Codes, or quick response codes, are huge in Japan, but even though they’ve been around for a while in the US, they’re only just beginning to gain adoption among marketers and public relations professionals. QR Codes let you download content with your cell phone camera. Instead of thumb typing on your mobile device, you snap a photo (or technically speaking “scan” a two-dimensional bar code) and you’re either directed to website, sent a file, text, calendar item or contact information. With the growth of location based social networking and smart phones, the possibilities for communicators to drive online traffic through QR codes are endless. 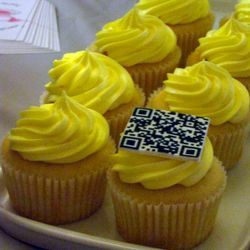 QR codes are appearing on billboards, comic books, tombstones...even cup cakes! In this episode, Wayne Sutton (@socialwayne) business development and marketing specialist at TriOut and Master Sergeant Donald Preston of US Forces, Japan talk about their experiences using QR Codes for organizational communications. 02:53 Wayne Sutton’s experience with QR Codes involves their use posters to promote a city arts festival to driving traffic to the schedule of events online and the development of a mobile application QR code reader. His North Carolina-based start-up TriOut is developing what he calls “Quick Check In Codes” which are QR Codes that can be used to check into location based social networking services more effortlessly by simply scanning a code. 04:47 QR Codes can be measured either through the use of custom URL redirects or QR Code generators with built in measurement analytics including the date and time, geolocation data and the type of mobile device that scanned the code. Combining QR code measurement with standard website metrics and a conversion activity like a newsletter sign registrations, a Facebook “Like” or a Twitter Follow would offers the best of all worlds. 06:43 Popular QR Code generators include Qreatebuzz.com, 2DCode.com and Kaywa.com. 07:25 Tippinn in New York which helps agencies and brands market with QR Codes warns against customizing the aesthetics to much, because it can cause them to fail when scanned. A positive user experience with a QR Code is more important than clever visual styling. It needs to load quickly, transit the user to the designated website, transmit the right calendar item or contact info. 10:51 To celebrate the 50 year anniversary of the Treaty of Mutual Cooperation between Japan and the United States, US Forces Japan produced a Manga comic book about what the US Military is doing in Japan, and to drive traffic to a corresponding public affairs campaign website. QR Codes are already hugely popular in Japan. 12:30 The Magna generated 16,000 unique visits from mobile devices (of which 7,000 were from iPhones) to the public affairs campaign website and was not at all difficult to sell to command because of the widespread adoption of QR Codes in Japan, which appear are on billboards, bus shelters and subway advertisements throughout Tokyo. 16:10 The use of QR Codes in the offline world versus on websites. A new WordPress Plug-In that auto generates a new QR Codes for each post to give readers the opportunity to scan posts and read them later on a mobile device or email them to a friend. 18:28 Sean McGarry (@writeMcSean) asks what is the benefit of QR Codes versus bar codes? Is this the mobile version of VHS versus Beta? And is there a QR version of Sticky Bits? But since people associated bar codes with price information, it may be easier for people to adopt the new behavior of scanning a code with a mobile device if the codes are something new and different. Wayne thinks QR Codes are new, so they’re more likely to be associated with new behavior. 21:20 Whether or not it’s a good idea to write something like “scan this code” right under the placement of a QR Code on a billboard or in print. Examples of QR Codes include a recent Calvin Klein billboard on Sunset Blvd., on tombstones to retrieve information about the deceased and for micro payments at Starbucks.